London burlesque heavyweights Betsy Rose, Missy Fatale and Jolie Papillon have conjured immersive magic at The King’s Head members club with Gin House Burlesque, a heady evening of tease, tipples and prohibition chic. 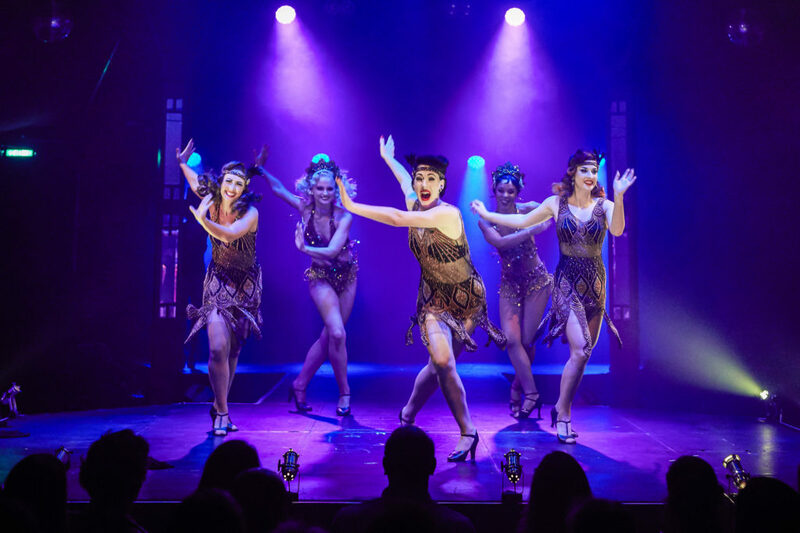 An adaptation – The Roaring Twenties Revue – has been brought to the Underbelly Spiegeltent to spice up the South Bank. The show begins as all Gin House soirees do: with opulent white plumes, delighted smiles, showbiz sparkle, and slick, tightly synched dancing. The three aforementioned stars each take a turn in the spotlight, flanked by supporting cast members Demi Noire and Didi Derriere. Enter dynamic and dangerous emcee Abigail Collins as Ritzy Crackers, launching into an inebriated rendition of Lullaby of Broadway and firing razor sharp quips at the audience. It’s dazzling to witness a first rate comedienne at the height of her powers. 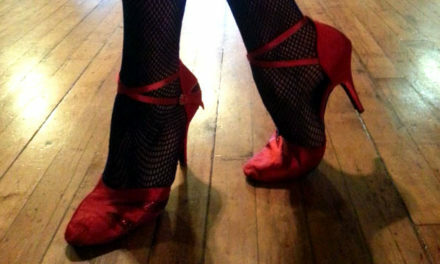 After a remarkable feat of cocktail contortion, she brings it home with Puttin’ On The Ritz, accompanied by a brief solo performance from a Madonna-like Didi Derriere, who is pretty and elegant, but a touch unsteady. Betsy Rose is the first of the headliners to take the stage, strutting out to St. James Infirmary in an exquisite Alston Stephanus costume. What follows is a truly religious experience. There are audible sighs of ecstasy and exertion as she flings out her slender, alabaster arms and lets her glossy black mane tumble down. She finishes with tantalising bump and grind; her entire being taut with intensity and eyes sparkling. Burlesque ingénues take note: this is how hard you should be working up there! Missy Fatale is a mesmerising Mata Hari, resplendent and smouldering as she wields fire wands and torches behind a flaming rope. It would be great to see a more developed choreography of events in this number so the removal progresses to a logical and satisfying climax. Jolie Papillon is a petite, pink present in a glittering gown, caressing an exquisitely plush white stole. The routine gradually warms up to a spirited Charleston, with dazzling high kicks and oversized powder puffs sending scented clouds into the air. I would love to see Jolie challenge herself more in this number with more developed choreography and sustained high energy. Gin House regular Demi Noire delivers her Josephine Baker tribute; a charismatic, faithful homage to the legendary original. Foot juggler extraordinaire Ulrike Storch performs a highly skilled routine with a generous sprinkling of Old Hollywood stardust. Imagine Marlene Dietrich tumbling an umbrella with exceptional dexterity and you begin to capture this charming, accomplished act. Everything that Rose, Fatale and Papillon put their names and collective creativity to has a stamp of quality, class and old school charm. This is a polished adaptation that inspires lust, laughter and awe in equal measure. Catch the last Gin House Burlesque: The Roaring Twenties Revue on 27th September at the Underbelly Festival 2017. Click here for details. EXPOSED: Beyond Burlesque screening at the ICA, London.